Certification: The next big thing for the kopi luwak industry? Six months ago, the release of the documentary “Our World Coffee’s Cruel Secret – Kopi Luwak” by BBC and Tony Wild, a coffee consultant (and also coincidentally, the first person who brought kopi luwak to the West), highlighted the plight of civets in the kopi luwak trade. 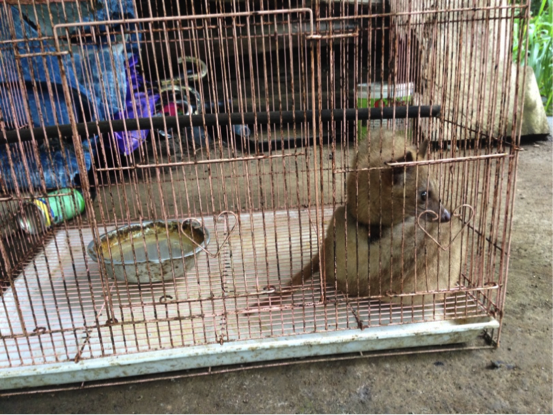 Following its wide reach and success, animal welfare groups such as PETA (People for the Ethical Treatment of Animals) and WSPA (World Society for the Protection of Animals) started their own campaigns to raise awareness of as well as call for action against the cruelty in the kopi luwak trade. The article concluded that as kopi luwak is part of Indonesia’s cultural heritage, solutions are necessary to preserve this heritage in order to help small scale farmers and ensure the protection of the natural environment. In April 2014, Tony Wild announced on his Kopi Luwak: Cut the Crap Facebook page that there will be discussions between the Government of Indonesia and The Specialty Coffee Association of Europe which may potentially result in the certification system of genuine wild-sourced kopi luwak. We are definitely looking forward to the day where consumers can enjoy kopi luwak with the assurance that their cuppa is 100% wild-sourced without fears of mislabeling. 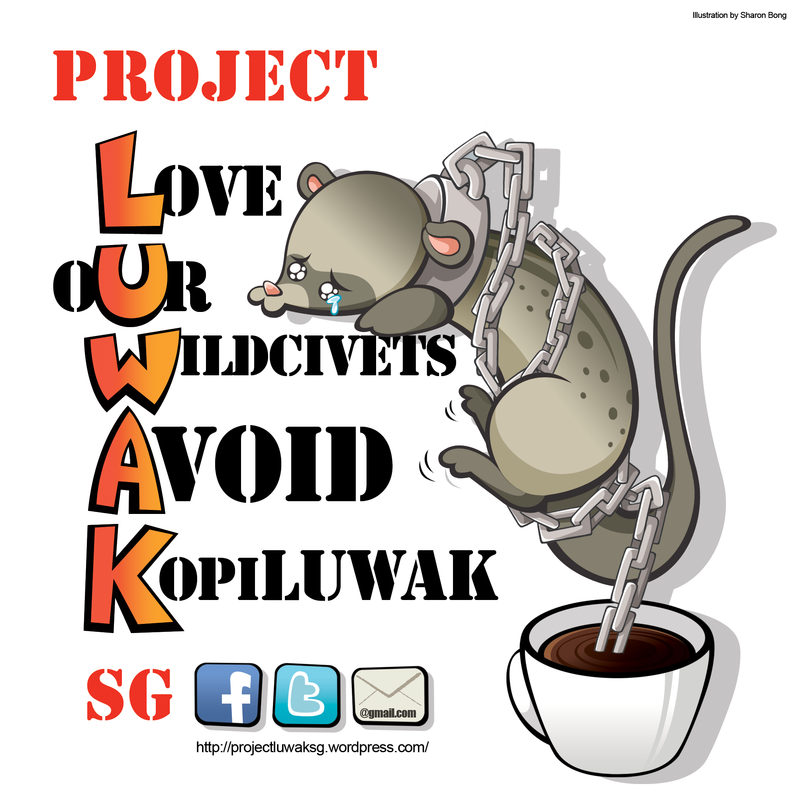 In the meantime, Project LUWAK SG will continue with our efforts in education and outreach to raise awareness of the cruelty behind kopi luwak from caged civets. Do join us! When I found out that my family and I were going to visit a coffee plantation in Bali, Indonesia, my first thought was that it was a ripe opportunity for some detective work. 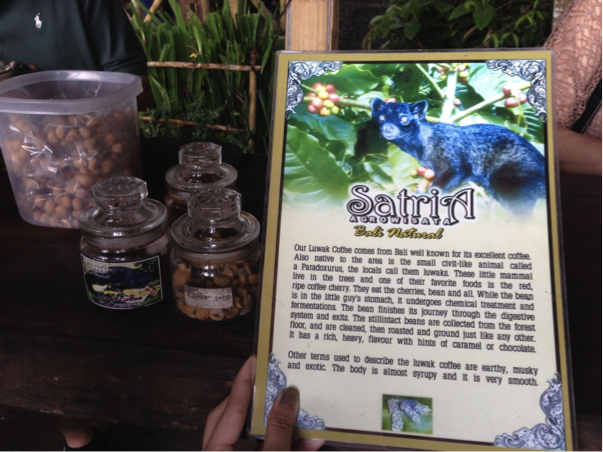 Bali, like Vietnam and elsewhere in Southeast Asia, is well known for kopi luwak. I was curious to see what the tour would be like. On the day of the tour, when we expressed interest in visiting a coffee plantation, our driver began telling us about kopi luwak excitedly – how exquisite it tastes, how unique it is and all. One of the staff at the coffee plantation then brought us around and explained the origins of kopi luwak. 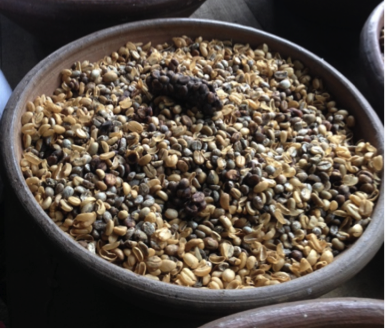 We were also shown civet poop with coffee beans, and how the coffee beans are processed. Coffee beans excreted by the luwaks being processed. Following that, it was a tour of the coffee plantation. Coffee plants among other crops were pointed out and finally I saw what caused my heart to drop despite all the mental preparation. Oblivious to my look of shock, we were enthusiastically introduced to the civet (or luwak) in the cage in front of us. The cage was about 6 by 8 feet. Aside from a metal bowl with water in the corner, there was nothing else. Civets are solitary and territorial animals, normally found on trees, so being in close proximity to other individuals – such as in farms – would be stressful. 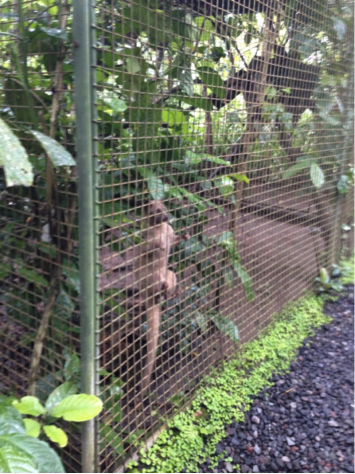 In total I saw some six caged civets on the premises that visitors had access to. Two were kept separately but within sight of each other (the cages above). The other four were kept together – two in a fairly large cage and two in poor conditions (rusty and small cage). It was a cage of about 2 feet by 1.5 feet, even more cramped than what I had seen initially. 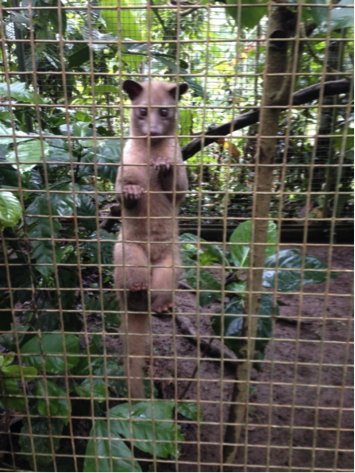 To find out more, I asked if the caged civets were farmed for kopi luwak. She insisted that the kopi luwak they sell are all wild-sourced. Upon asking what the civets were fed, she replied, “Fruits such as bananas and apples”. We were then herded to a pavilion where we were allowed to taste the various coffees before purchasing the ones we liked. This excluded kopi luwak which was ‘pay-before-you-try’. We gave that a miss. “Collected from the forest floor”? At the gift shop, a wide array of coffees were for sale, including kopi luwak. The sales representative was visibly disappointed at our lack of enthusiasm but tried to promote the boxes of kopi luwak which she said make good gifts. 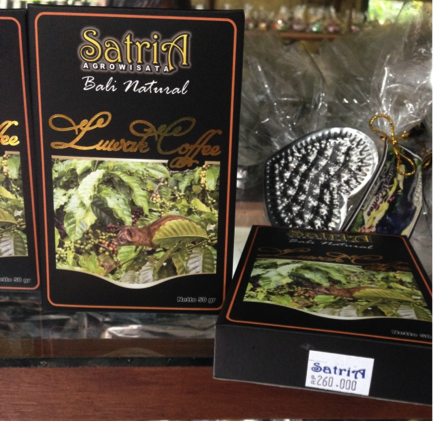 One brand of kopi luwak on sale (260 000 Indonesian Rupiah = approximately 30 Singapore Dollars). While my experience suggests that this coffee plantation may be farming civets for kopi luwak, I must emphasize that I do not have any concrete evidence (and am thus not pointing fingers). 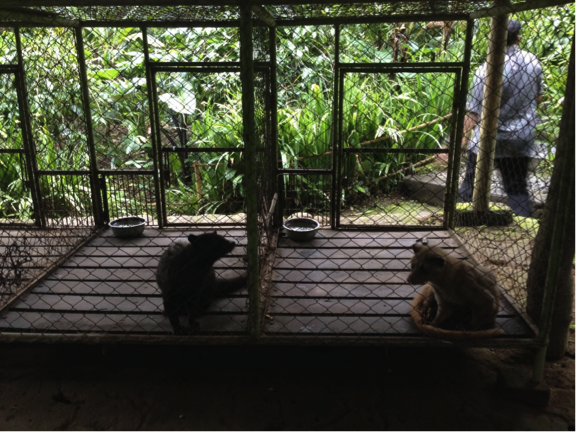 This write-up was purely intended to share my experience in Bali, highlight how rampant kopi luwak is over there, and hopefully give readers some food for thought. Wild-sourced kopi luwak is roasted from the coffee beans pooped out by wild civets which pick only the best coffee beans to supplement their diet. Farmed civets are fed a diet of only coffee beans, so without any choice in the coffee beans, would the quality not drop? 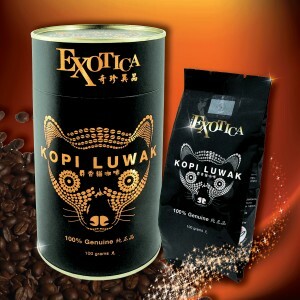 Many buy this coffee on the assumption that it tastes better, but with farmed kopi luwak these days, how true is that? Animal welfare aside, perhaps think about that if the thought of purchasing that very expensive cup of kopi luwak ever crossed your mind. In the market of specialty coffees (think Jamaican Blue Mountain, Hawaiian Kona and what have you), there lies a niche in a league of its own. These are the ‘animal poop coffees’ and while hearing their source of processing may often make one pause, they have since become some of the most expensive coffees in the world. Luxury coffee. Image from The Coffee Locator. Most famous of these coffees is kopi luwak, also known by its other names of civet coffee, crap coffee, and 麝香猫咖啡 (shè xiāng māo kā fēi). Kopi luwak refers to the coffee made from beans that have passed through the gut of the luwak or common palm civet (Paradoxurus hermaphroditus). 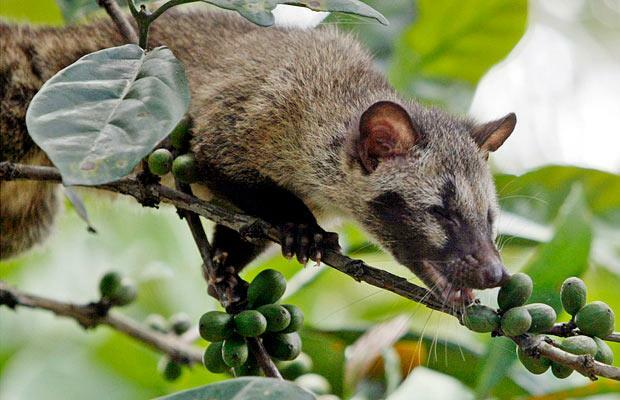 Civets are believed to select and feed on prime coffee cherries. The stones (i.e. the coffee beans) pass through their system undigested. These prized coffee beans are then recovered in their droppings (i.e. poop) and are given a thorough cleaning before they reach consumers hankering for something novel. But how did this all start? Much like the humble beginnings of say, ratatouille from France and closer to home, bean sprouts with salted fish, kopi luwak was a poor man’s food. First brought into the west as a curiosity by Tony Wild in 1991 after he read a brief description of it in National Geographic some ten years earlier, kopi luwak was suddenly catapulted into international fame and there began its rag-to-riches story. It is necessary to delve a little into the history of coffee to understand the origins of kopi luwak. Though there are over a hundred species in the Coffea genus of which coffee belongs, only three species are commercially grown to produce the ubiquitous beverage. In order of market share, these are arabica (Coffea arabica), robusta (C. canephora) and liberica (C. liberica). Endemic to the highlands of Ethiopia, southeastern Sudan and northern Kenya, C. arabica somehow found its way to Yemen and from there, the Dutch East India Company brought it to the Dutch colony of Java in the 1690s. Most, if not all, accounts point to the ‘discovery’ of kopi luwak during the mid-nineteenth century when the Cultivation System (or “cultuurstelsel” in Dutch) came into force. During this period, it became mandatory for a portion of agricultural production to be set aside for export crops. Ironically, by prohibiting any picking of coffee cherries for personal consumption, the Dutch inadvertently piqued the curiosity of native farmers and plantations workers who wanted a taste of this much sought-after cash crop. Wild civet eating coffee cherries. Image from Hungry House. Enter the luwak: locals soon learned civets were slipping into plantations and eating coffee cherries. Instead of perceiving it as a problem, however, they realised that their desire to drink coffee could be satisfied by harvesting the beans that lay undigested in civets’ droppings. Kopi luwak was born, and word of this soon got out to the Dutch plantation owners. Hard to come by and only available in small quantities, wild-sourced kopi luwak already fetch a premium then. These days, however, kopi luwak is no longer rare, depending on caged civets to provide a ready supply. Farming civets is a quick and dirty method to boost supply and the high price tag – supposedly reflecting its rarity – continues to profit traders who want to cash in. Caught from the wild and put into small cages alongside other civets, these naturally solitary animals eventually succumb to stress, if they don’t die from caffeine overdose first. 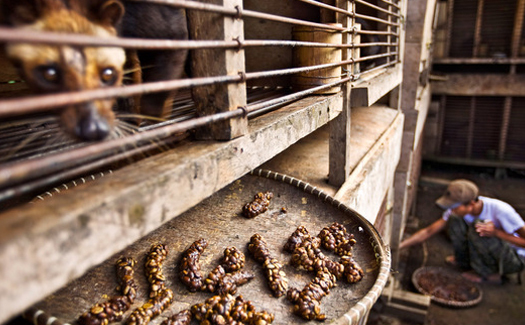 Civet caged to make poop coffee. Image from Fat Nancy’s New Diet. Though it is wild-sourced kopi luwak that is rare nowadays, the story pumped to the masses remains unchanged, allowing the vicious cycle to continue. Yuck factor aside, if made the old-fashioned way, I’d say let kopi luwak live on. Otherwise, in the words of Tony Wild, who now runs a campaign against kopi luwak, it’s time to cut the crap. Find out how you can help at https://projectluwaksg.wordpress.com/support. 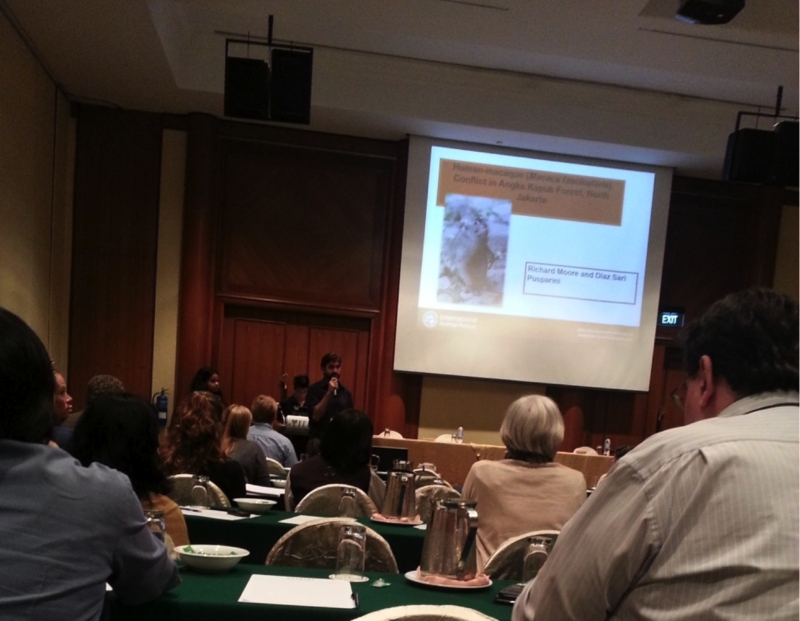 Hosted by ACRES, the Asia for Animals Conference (AFA), which took place in Singapore on 13-17 January 2014, brought together numerous animal welfare organisations in Asia. It provided a platform for networking opportunities as well as discussions of pertinent issues. I was extremely pleased to be a part of it. I had the invaluable opportunity to meet many like-minded individuals from the different animal welfare groups out there. Like Project LUWAK SG, their main mission is to push for the humane treatment and protection of animals. Elephants (ivory) and sharks (sharks’ fin) are regularly featured in the news. Battles to put an end to the senseless trades continue to be waged, lost and sometimes won. Although the kopi luwak trade was not strongly featured during AFA, several lessons could be drawn from efforts to tackle similar trades. A representative from the International Fund for Animal Welfare (IFAW) explained that ivory, as with many other products implicated in the wildlife trade, remains a coveted item by wealthy families. Efforts taken by IFAW include urging online shopping websites such as Tao Bao to implement zero tolerance policies to ivory trade. Emphasis was also placed on the importance of strengthening policies, enhancing enforcement and stigmatizing the possession of ivory by destroying existing stocks or seized shipments. Such steps have been taken in China and Hong Kong. Several success stories provide testament to the unwavering perseverance of animal activists. Public awareness campaigns led by shark conservation groups, animal welfare activists and the alike, led to governments in China and Hong Kong announcing a ban of shark fin soup in official state banquets. On top of that, many hotels, airline companies and restaurants have also responded positively by removing shark fin soup off their menu. In Singapore, supermarkets such as Cold Storage and NTUC Fairprice have removed shark fin products off their shelves in recent years. Shark conservation groups such as Shark Savers continues to work with local celebrities to endorse their campaign ‘I’m FINished with Fins“. Gladys and I also took the opportunity to introduce Project LUWAK SG through our newly printed decals, designed by Sharon Bong and sponsored by SKL0. To our delight, our stack of decals was gone by the end of the day! 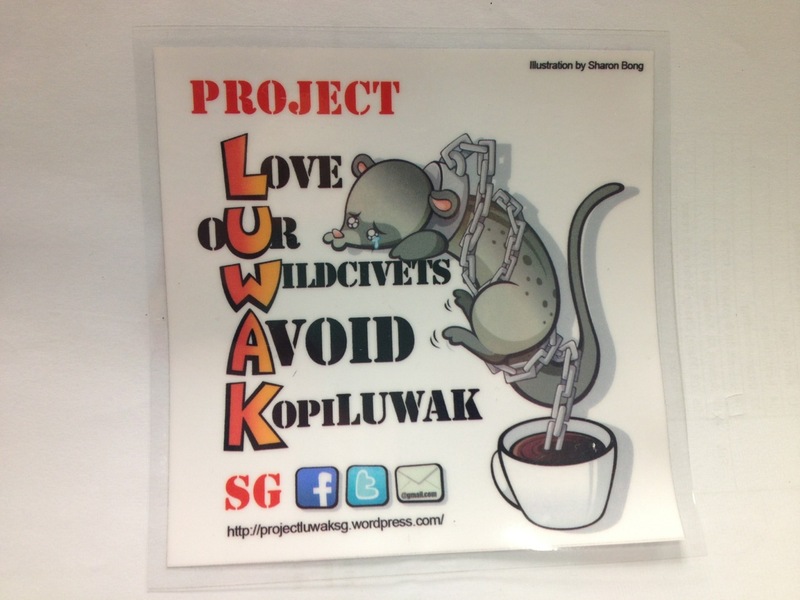 We also managed to speak to several conference delegates about Project LUWAK SG. Hopefully more people will learn about us and most importantly, about the cruelty behind the production of kopi luwak from caged civets. Please help us to spread the word and get more people to pledge to not support the trade in any way. Every person counts! Learn more at https://projectluwaksg.wordpress.com/support/. Coffee culture & appreciation – Where does Kopi Luwak fit in? The Economist’s free coffee drive done in bad taste?